Jet lag is finally gone (I think!) and reality has sunk in. Sixteen days of absolute bliss are now embedded in my memory, only to be drawn upon when everyday life gets crazy. Greece was incredible and it was the much needed break I desperately required to reset mind, body and soul. Hot days were filled with mini-adventures along the western coast of this Mediterranean jewel. The kids and I stayed with family and our experience was more authentic and true than if we had booked hotels and tours. For this, I am forever grateful to L and G and the multitude of friends they brought into our lives. We were welcomed at the Athens airport by a wonderful Greek man, who offered to pick us up and take us to the bus station. His command of the English language was minimal and my knowledge of Greek was nil but we still managed to communicate using hand gestures and a lot of smiles. Even on the bus, I sat beside a man who spoke very little but managed to convey a hearty "Welcome to my country". I was becoming enamoured with the friendliness and immense pride of the Greek people very quickly. My children were welcomed into the inner circle of my family's neighbours and embraced wholeheartedly. Again, language was a bit of an issue but children have this remarkable way of communicating without speaking a word. Watching these new friends take the hands of my children, I couldn't help but think "if only children ruled the world". They are already making plans for a longer visit next year, without MOM. I discovered that Greece is more than the photos we see of Santorini and Mykonos. Inside the shorelines of the birthplace of so much of the modern world lies many hidden gems. 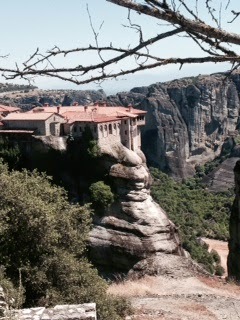 My cousin brought us to one of these treasures, a place called Meteora. It is a picturesque sandstone complex that houses six Eastern Orthodox monasteries that are built on top of each pillar. I had never seen anything like this before and was blown away at how pretty it was. How these monasteries were constructed high above the ground on the surface of each pillar was incredible. The walk up was one that left me shaky and sore for days! Walking around the monastery I felt as though I was that much closer to heaven. The view was incredible and the silence that filled the air was almost mystical. A visit to Greece would not be complete without an island tour. As I mentioned, we did not venture to the tourist islands of the south but were able to explore one of the northwest islands in the Aegean, Skiathos. Our boat ride was an event. It made me remember how happy people on vacation are. The captain, a man lovingly referred to as “Tarzan”, made the voyage over incredibly entertaining. Gathering up all passengers from the top deck, he cranked up the music and taught them the basics of the Sirtaki, a traditional Greek dance. Once the dancing was over, the true spirit of this Greek sailor took hold. “Look a dolphin on the right!” he screamed over the speaker and the entire boatload of passengers ran to the right. Seconds later, “Sorry, I meant left!” and passengers went left causing the boat to rock. All that could be heard was a little chuckle over the speaker. Rocking the boat was all part of the experience. 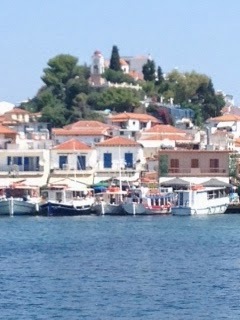 As the boat sailed up to the port of Skiathos, I gasped. This was what I pictured Greece to look like. 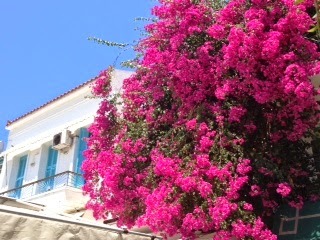 Pristine white buildings with pink bougainvilleas flanked against a clear blue sky and turquoise water. Sailboats dotted the port and cafes were filled along the waterfront. Needless to say, I could have stayed forever, sitting in one of those cafes with pen in hand and notebook open, chronicling what I saw and what I could imagine. A writer’s dream. The kids wanted, no craved, more ruins. They wanted to see the things that they only read about. Fortunately, they both studied Greek civilization and mythology this year and it woke up some intense curiousity on their part. So off we headed to Dion and Mount Olympus. I have to say that walking through the ruins of this ancient and important city was chilling. Alexander the Great walked these steps. My son was completely loving this part of the experience. 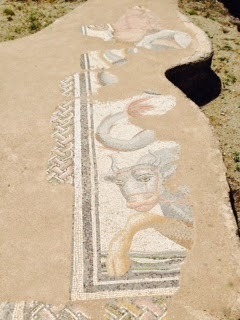 Mosaics from ancient bath houses, statues of the gods, theatres and homes of the people of Dion had been dug up and made available for all to see. 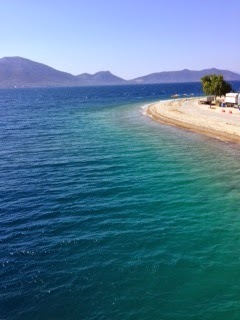 The island of Evia, surrounded by green and turquoise water, was a welcome surprise. Once thought to have been part of the mainland, Evia possesses a secret known by few, the healing mineral baths of Edipsos. The water ranges from cool to extreme. 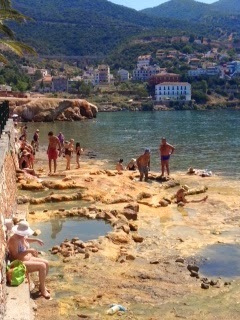 Young and old, Greek tourists and locals sit on the pinkish rocks letting the thermal waters flow upon them and work their healing powers. I felt invigorated moving back and forth from the hot running water to the cooler water of the sea. It was blissful. Our last stop on this amazing journey was Athens. Now I had heard mixed reviews on what to expect. Beautiful, old, dirty, crowded. I tried not to let other peoples experiences cloud my initial thoughts. What I will tell you is that as the kids and I walked into Monistiraki and saw the Acropolis peaking down through the buildings, I felt chills. This is something we don’t experience in a young country like Canada; the feeling of being part of something so much bigger, of historical significance. It hit me like a tonne of bricks. I was in the same place as some of the great minds that helped shape modern civilization. Walking up (seemed like everywhere we went it was an upward climb!) 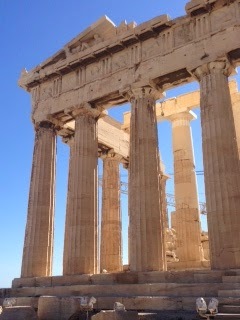 the Acropolis, the kids were amazed. The Parthenon, thousands of years old, still stood. Of course the questions erupted like a volcano. “How can it still stand?” “Why are parts missing?” “Who fixes them and how do they know what it looked like?” “Did the gods really exist?” I absolutely LOVE the curiousity that lives within them. (Of course, I had to google everything to formulate an even plausible reply). This trip reset a lot of things. I was able to slow down and catch up with life, with me and with the kids. We had no pressure and enjoyed the moments that seemed to linger just a little bit longer while there. We did see wonderful things but this journey was about reconnecting. And we did that through a shared experience and being in the moment without interruption. Talk to me! What is your summer adventure this year?